The Lloyd large 3 lamp Art Deco design Tiffany pendant light, with polished aluminium fittings. A wonderful striking Tiffany lighting design in the spirit of American designer Frank Lloyd Wright, hand crafted in the traditional manner using age-old soldering techniques. 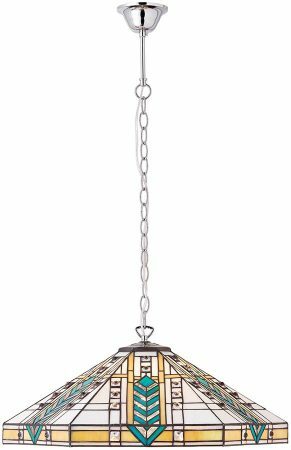 A striking downward facing 57.5cm hexagonal Tiffany ceiling pendant, suspended from a highly polished aluminium ceiling mount and chain. With an opal base colour, geometric honey amber outlined panels and a bold chevron design in shades of green and clear glass decorating each of the six sides. This design uses lots of beveled art glass that will really catch the light and sparkle when illuminated. Height adjustable at the time of installation, minimum height 43cm, maximum drop 136cm. A 57.5cm diameter ceiling pendant that will become the centre piece of any room or landing in an Art Deco themed home. This is a hand-crafted Tiffany style ceiling lamp and the shade colours may differ slightly from the image shown, as each piece of glass is hand-made and may differ slightly in colour or shade. This should not be seen as a fault, rather something that makes each Tiffany shade unique.